HUNTINGDON, Pa. -- The oldest known living person in the United States is celebrating her 114th birthday in Pennsylvania. 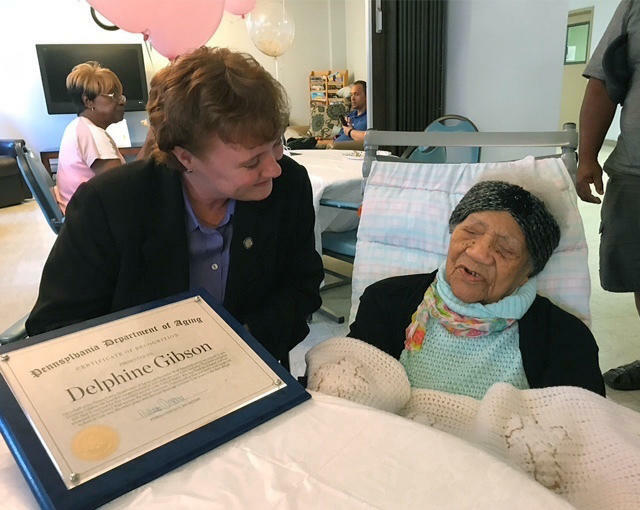 The state Aging Department says Delphine Gibson hit the milestone Thursday and got a personal greeting from the governor. Gibson was born in South Carolina in 1903 and moved to Pennsylvania after marrying Taylor Gibson in 1928. She's been a resident of AristaCare in Huntingdon Park for the past 15 years. Aging Secretary Teresa Osborne says Gibson attributes her long life to a faith in God. She's a member of Mount Hope Missionary Baptist Church. Gibson's status as the nation's oldest person is according to the Gerontology Research Group, which tracks people older than 110 worldwide.